OK moms, don’t you hate it when you are storing either your baby’s bottles or toddlers’ Sippy cups in the fridge and it takes up so much space. Not only that, but you have to figure out how to accommodate room for the other groceries you just stocked up on. Recently I was asked to do a review on the Universal Baby Bottle and Sippy Cup Organizer from PRK Products INC, and man did it come at perfect time. After we brought our little miss home, I began to prepare some bottles in advance. The Universal Baby Bottle and Sippy Cup Organizer has 3 different widths you can adjust in relation to the size of the bottle you are using. I was using 6 ounce bottles, the first slot was a tad small and the second slot was a tad too wide but I realized that you can even let the notch sit in between slots and it holds as well without slipping and bottles going everywhere. Now instead of 3 you actually have 6 different widths to choose from so that was pretty great too. I was able to fit 10 bottles inside the organizer with ease and still had room for more! 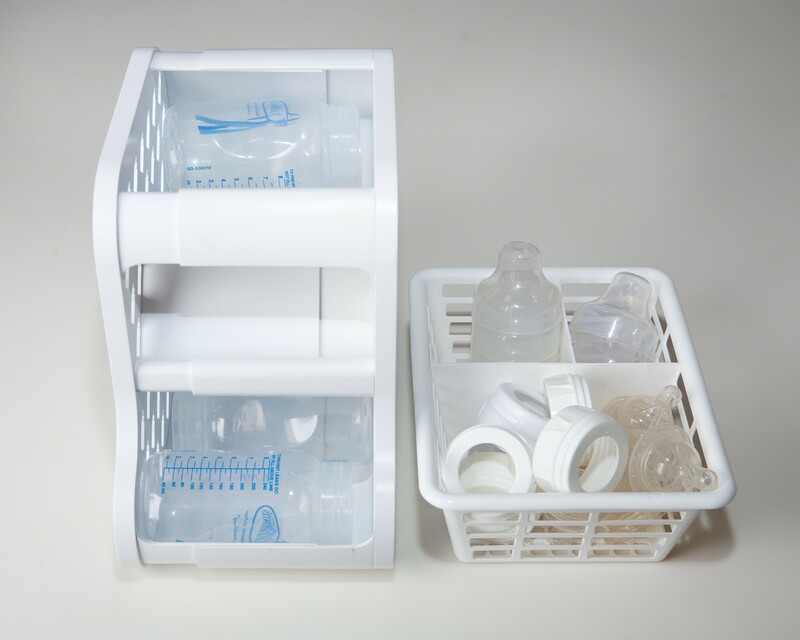 Inserting the bottles inside the Universal Baby Bottle and Sippy Cup Organizer is very simple. You just kind of drop them in and they stack up on their own. Now instead of a million bottles all over my fridge, they have their own little section to sit in and I can still place my other groceries around it without a problem. You also get an organizer basket you can separate the pieces to the bottles, or do like I did and I keep it in my sink, so when I finish with a bottle, I can separate it and keep it away from my other dishes that may be in the sink. I absolutely love the Universal Baby Bottle and Sippy Cup Organizer. You can do so much with the organizer and storage basket and can put it practically anywhere in your kitchen. I recommend all moms out there to definitely get one. I have no complaints about this product at all and hope others enjoy it as much as I did. They also have a great Universal Baby Food Jar Organizer you may want to check out also! I know i am planning on ordering one of these when we start on baby food! Make sure to get your Universal Baby Bottle and Sippy Cup Organizer today at www.PRKproductsinc.com and Amazon.com for only 24.95! Bringing home a newborn can definitely be nerve wrecking. Well, at least for me it was. I’m one of those moms who cannot be away from my baby girl at all, and as my husband says “babe you have separation anxiety” lol. I’m constantly making sure she’s breathing, if she coughs my heart stops; let’s just say I’m a nervous wreck. Nothing makes me go more crazy then when it comes down to nap time or at night when she is sleeping. Even though I can sit and stare at her and listen to see if she’s breathing ok, I can’t be there ALL the time, and I’m so terrified of SIDS. I was asked to do a review on Lorex Technology new baby monitor called the LIVE Sense PT Baby Monitor. This is an awesome monitor that has definitely put just a few of my nerves at ease 🙂 . The LIVE Sense PT Baby Monitor has a pan tilt camera that allows for full control over the view of your baby and the room. It has an advanced voice trigger technology that signals an alert and lets you know you know if the baby is crying and even if someone is in the baby room you can listen in. 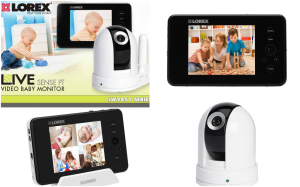 It’s expandable to up to 4 cameras (whether for different bedrooms or household areas), the Lorex LIVESense PT also includes one-touch video records, remote viewing on Skype and a two-way talk feature. You can also hit a button on the monitor and it will play pre-set lullabies in the baby room from wherever you are. The LIVE Sense PT is by far one of the best monitors I have ever seen or use. I feel so in control without having to be right under her. Whenever she cries or coughs etc my monitor gives out and alert beep, and either my husband or I will go into the room. If I want him to position her differently or do something in her room, all I have to do is hit the talk button and we can communicate through the monitors without having to be in the same room. I also love that I can change the direction of the camera from my monitor with the toggle button. I literally can look around her whole entire room and make sure everything is the way it’s supposed to be. It also has automatic night vision on it, so you can see your little one at night to. Here is a pic from Skype looking into Jazzie’s crib. It also tells you the room temperature and includes the date and time. What really touched my heart was the fact that I could connect the monitor to my computer and Skype my family back in Georgia, and it took 5 minutes to set up, it was super easy. This way the family was able to see the baby and interact with her rather than just seeing pictures, and they really enjoyed it to. Not only can you Skype family, but if you are a crazy mom like me and you are running errands and rather see your baby is doing ok rather than being told on the phone she’s ok you can use Skype on your phone and look into her room as well. The setup for that is so simple and comes with instructions on how to do so as well. In a nutshell you download info off a cd they give you, download Skype, and connect with a USB cord. You can also put a SD card in and record and save it, so you can capture every great moment! This monitor does so many things and it has truly helped me a lot. I call it my extra set of eyes lol. The only negative thing in my opinion is I wish I could hear the baby crying better. Granted an alarm goes off and you can hear it loud and clear, I just wish that when I look at the screen to see what’s wrong her cry can be heard louder, without the camera having to be closer. It also could be because my little still has that soft baby cry, so I’ll just have to wait and see. Other than that you cannot go wrong with this monitor. Allows you to soothe a fussy baby, even when you aren’t in the same room. Also includes built-in lullabies. Audio indicator lights display the level of noise being picked up by the camera. Connect from anywhere in the world using Skype. 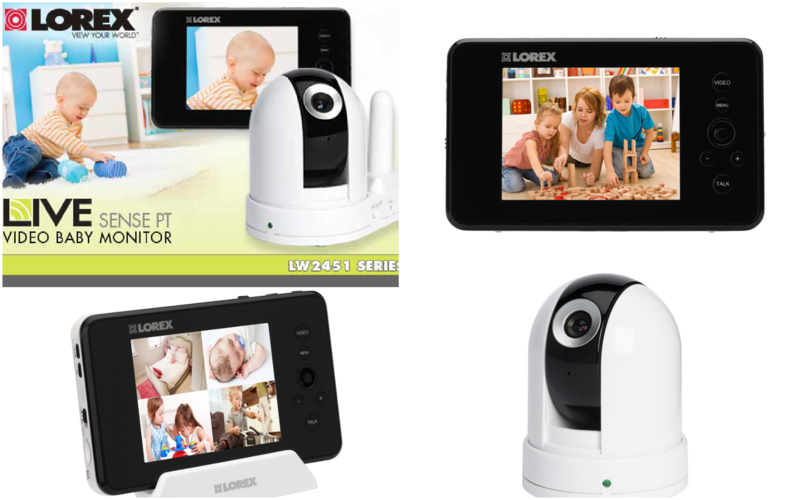 Expandable up to 4 cameras for complete awareness of your home (additional cameras not included). Including 3rd-generation or later iPod touch, iPhone 3GS, iPhone 4, iPhone 4S, iPad and iPad 2 for wide-ranging use. Features a CMOS image sensor with a 4.5mm lens (f/2.8) that produces sharp, clear video with 656 x 488 resolution. Pans up to 240° and tilts up to 130° for an ideal view of your baby. For easy viewing in low-light conditions. For optimal viewing from multiple vantage points. Features a 320 x 240 resolution for clear, detailed images. Viewing modes include single channel, scan and quad split screen. Included docking cradle keeps the monitor charged and ready for use. For monitoring the climate in your child’s room. Built-in alarm alerts you if the temperature changes outside of the selected range. Helps you keep track of feedings. Allows you to capture special moments for playback on the monitor. Allows you to store or transfer video to your computer for uploading to Web sites, including Facebook and YouTube. 1GB microSD card included. It’s available at bestbuy.com, Lorex Technology site and Amazon has it on sale for $205.98 & ships for FREE with Super Saver Shipping. 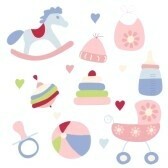 This would make a perfect baby shower gift and a must have for any new parent! 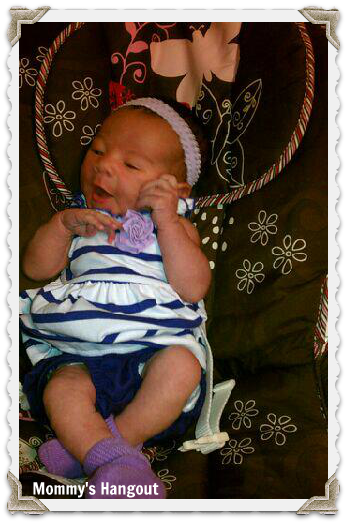 Wow, I can’t believe a week has already gone by since I had my little princess. What an amazing experience and I’m still in awe everytime I look at her. I can’t believe that this little bundle of joy had been “baking” inside of me this whole time and how the heck did she fit lol. On Monday June 18 at 9:00 that morning I sent my husband a text message saying Jazlyn was gonna come today, it was uncontrollable. I just sent it without even hesitating or thinking too much about it. Later that day, I went to the pool with my little sister-in-law who was visiting us because my husband wanted her there for when Jazlyn arrived. We came home, had lunch, rested and waited for Jullian to get off at 5. When 5 o’clock rolled around, Jullian came home changed clothes and began to cook dinner while his sister went in the backyard to play. About 5:30, I looked out the window to check on her and that’s when it happened. I thought I had peed on myself and spent the next few minutes questioning myself whether I did or not lol. It finally hit me that my water broke when the light trickle turned into a flat out gush after I called my mom to ask her what was happening. I yelled to my husband that we needed to leave NOW. I always said that whenever it was time for me to go in I’d be patient and calm. Ha, was I ever opposite of that. I was throwing extra things into my already packed bag freaking out thinking I didn’t have everything. After I had the whole house packed in my bag we went to the hospital. We arrived about 6 being that I live right next to it and was instantly admitted and placed in my room. Here I was hooked up to IV and spoke with the anesthesiologist and the waiting period began. I was only 3 cm at 50% effaced. The contraction monitor showed me having contractions out the wazoo but I didn’t feel any of them. Later that night we had a slight scare. 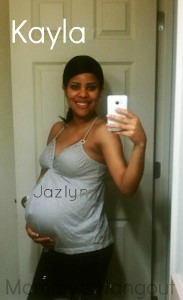 Jazlyn’s heartbeat was in the high 170s and would drop at every contraction. The doctors said it’s called a decell and is very dangerous. They gave me meds to stop my contractions to get her heartbeat at a healthy beat. Thank God it worked because if not an emergency C-section was in my path. After a few hours, the doctor had let the meds run its course and then gave me pitocin to start my contractions again and hoy did I feel them now. Every 30 minutes they increased my amount until my contractions were close together. By now I was 5 cm and it’s about 11 o’clock. Around 1 AM I received my epidural which was amazing. My pain went from a 9 to a 2. I felt awesome. Before I knew it 5 o’clock rolled around and it was time for practice pushes. Pushing was way harder than I imagined. I thought I was gonna pop a brain cell. After that it was time for the real deal. After giving some great pushes and Jazlyn trying to go back inside while I was pushing her out she embraced us with her presence at 6:34 am June 19, weighing 6lbs 9ounces, 19inches long. Not to mention it was my dad’s birthday and he had been texting requests for her to not to come until the 19th. It was such a breath taking moment. I had an awesome experience and I’m so blessed my husband was there and was such a great help and helped me stay positive the whole time. He’s amazing and I’m blessed my little girl is going to have an amazing father. I’m also thankful my mom was there every second I needed to text or call her no matter how late it was. It was tuff not having her there but knowing she was a text or call away and answered every time definitely made up for it. Jazlyn is such an amazing baby. She has the funniest facial expressions. It’s amazing how fast you can fall in love with your baby. I’m so attached and I’m also scared to let her sleep in her own crib lol. She’s truly a blessing and I smile every time I look at her. Sorry for such a long update! Hope you enjoy. And of course you all know Jen was blowing up my phone hahaha I love her 😉 and glad she kept you all posted as well. What Else Can A Baby Girl Need? As my due date gets closer and closer, I keep asking myself am I prepared, do I have everything I need, what should I pack in my hospitalbag? All these questions are racing through my mind as I run all over the place ( ok ok waddle all over the place lol) All I know for certain is I am ready to meet my precious little girl for the first time. It seems like I have been pregnant forever! I am due June 28th but my DR. told me I could go any time now. So please share anything you think I might be forgetting or need?! I would also love to hear about you’reMust HAVE favorite products. Hi everybody, my name is Kayla. I’m so excited to be a new writer for Mommy’s Hangout. I’m 21 years old army wife (which is a job in itself: P), and we are expecting our baby girl Jazlyn any day now. (I wish she would hurry up and make her grand entrance, because Louisian heat and pregnancy definitely do not mix well!). Being new to the “mommy world” has some difficulties. Sometimes I have no idea which products are the best, what to expect, and all that other stuff new moms must deal with. So I’m looking forward to getting to know more new moms, getting advice from moms that have already been there done that, and of course doing product reviews so I can help other new moms save money. With this being my first baby i am sure we bought a lot of stuff we really don’t need! So I will be letting other new moms know what’s a hot and what’s not! 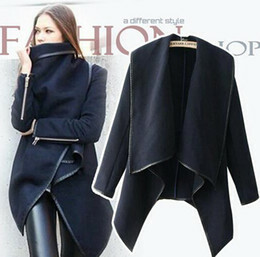 I am also looking forward to networking with all you thrifty moms and hopefully get a hang on this couponing deal. I cringe every time I’m at the store and spend 100$ on groceries, while the mom behinds me pulls out her coupons and spends 2 bucks and has twice as many items as I do! Talk about some hurt feelings lol. So please feel free to share your tips! Feel free to follow me on twitter @mommyshangout and email me any time @ kayla@mommyshangout.com.